This post is simple. 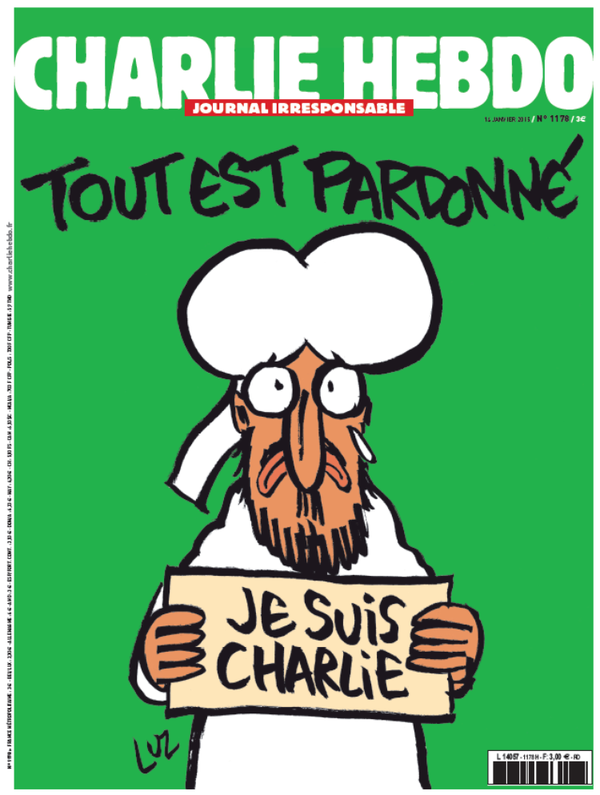 Just the cover of the latest Charlie Hebdo. If you think you will be offended by it, don’t look. If your gut is made of sterner stuff, have a look see. This entry was posted on January 14, 2015 at 1:41 PM and is filed under In the News with tags Charlie Hebdo, free speech. You can follow any responses to this entry through the RSS 2.0 feed. Responses are currently closed, but you can trackback from your own site. Does one need stern guts to look at this? Comparative adjective. Look it up. Jason, what do you think of being called daddy? I think you need stern guts to be able to stand being called daddy by someone you’re romantically or sexually involved with. You’re making me laugh. You have this way of talking about your opinions. Daddy, please tell me why you have such an aversion to it. What am I supposed to call you in return? Baby girl? Maybe I don’t mind so much now. No, seriously speaking it’s not an aversion, I just think you should set aside words that could possibly potentially most likely be used by a daughter in the future if you happen to produce one. But mostly it’s just that it’s a little cringey and I can’t take it seriously. It doesn’t turn me on. I guess for those who don’t like it, it’s something you could get used to and maybe even start liking. Depends on the girl using it in that case. My long winded answer to your question. I love being called baby. As a term of endearment it’s so lovely. I love it. Whether it’s used casually, lovingly, affectionately, it’s great. I understand what you mean. Can you imagine your daughter calling you daddy and your wife says NO I CALLED HIM THAT FIRST. And then the daughter and wife fight over it and you’re like WHOSE YOUR DADDY. And they shout in unison YOU DA DADDY. Just imagine. That’s not to say I’m mocking it. Just a scenario to consider for the imaginative overthinkers. I like using it, for some reason. Or maybe I don’t? I don’t know. I don’t mind. Or maybe I do. Ugh. Daddy, I can’t make up my mind about it! Also, do submissive girls turn you on? Hmm, so technically you’re answering yes to my question. Your playful silliness and that outrageous scenario, it’s all entertaining. But as far submissiveness goes, I think you’re good at being submissive when the situation calls for it or the person you’re interacting with subconsciously demands that kind of behaviour from you. I don’t know if I’m making sense here, but I think you’re extremely good at being submissive. I think there’s more to you than that. You can take that to mean what you want it to mean. You’re unbelievable. Okay Jason, I think you made it clear to me who you are. You know me don’t you. There’s no way you don’t after saying all that and you know what! This is all very weird. It’s beyond weird. I don’t even get it. You’re playing games with me. I can’t even laugh at that and take it as a joke because it isn’t. Can you tell me you weren’t joking when you said you were him so I can decide what to do. Please, daddy!! I keep giggling over the daddy thing but only because it’s you I’m addressing like that. Okay, spill the beans on this toast now. Daddy. I want to smack you (in a way you’d enjoy of course) for various reasons. The reason I am even on this blog. Well, it’ll all be explained if you decide you want to know. Well done for realising. It’s the biggest hint I could drop. I thought I’d email you but I had your old one but now that you’ve realised, you know who to get my number from. Or do you need me to drop in little hints for you to realise who I’m talking about. Let’s hope not. Do whatever you want. I don’t care! Okay okay I apologise in advance for anything you have seen here in terms of my comments that have fuelled any kind of disapproval okay I don’t care if that didn’t make sense. And I know who you’re talking about! Okay I’ll call you as soon as she’s given it to me. Okay. Great. Make sure you pick up!! Can I just ask, would you feel the same way you do now in regards to the Charlie Hebdo cartoons if it was, let’s say Mary’s cartoons in place of Muhammad, illustrated in a slightly mocking manner and then a jump to pornographically? Even if you were against the killings, let’s say some Christians decided to kill, would you continue after that with the posting of another illustration of her with the message All is forgiven and Je Suis Charlie. I have the feeling you’d most likely leave the illustrations alone and not post though you’d still be against the killings. I’m hoping for a genuinely honest answer. I think you mean cartoons of the Virgin Mary. Yes, I would just as strongly condemn the killing and just as vehemently defend free speech. And yes, I would post the images. Freedom of speech is important. Freedom of speech for some and not for all is not freedom of speech. There is a difference between saying we should not insult religion and saying we are not allowed to insult religion. Certainly the argument can be made that if I do not want my religion ridiculed I should not ridicule the religions of others. But by that same principle, if you want freedom of speech, then you should allow others that same freedom. And that means even for atheists who do not like religion. Which is what the Charlie Hebdo cartoonists were. So, yes, I would defend those cartoonists even had they been killed by Christians over their cartoons ridiculing Christianity. Can I ask you a not relevant to this topic question? I’m preparing myself for a no you may not. And you approved the comment that made no sense. The comment you asked not be approved has not been approved. You can see the comment because you made it. I will eliminate it later. Yes, you may ask an off-topic question. YAY! FINALLY! Receiving your permission made me happier than it should have! Okay, breath right? I should breath and calm down. Hopefully you won’t regret allowing me this question and it’s not a joke. It’s a serious question. What’s your opinion on the concept of girls calling their boyfriends daddy? If you apply that to referring to a Dominant like that it’s a little hmm. I don’t know but I want your thoughts on it. Some men like it. I have nothing against it. It does often indicate a Daddy/little girl dynamic, but not always. It can also be just a loving endearment. Either way, so long as it is done respectfully and not in a mocking manner, it is perfectly acceptable (in my opinion). Did you think I was being disrespectful and mocking when I, you know, used it. I do not recall you using it, but if you did and it had bothered me, I would have said so. Maybe you didn’t receive my email for whatever reason. It wasn’t ages ago. Anyways, ‘I am Charlie’ Is thee truly forgiven?